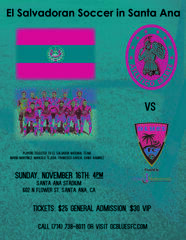 SANTA ANA, CA (November 6, 2014) – The City of Santa Ana is hosting the Orange County Blues FC soccer team in an international friendly match against El Salvador Primera Division side Club Deportivo Atlético Marte on Sunday, November 16th at 4pm at Santa Ana Stadium. This will be the first International match for the recently rebranded OC Blues FC and their first ever game at Santa Ana Stadium. “This is a great opportunity for the City of Santa Ana. This is a chance to see world class soccer players right here at our home stadium. We hope visitors who come out to enjoy the international match will take the opportunity visit our downtown and that this will be the first of many games,” said Mayor Miguel Pulido. “Santa Ana has a large soccer playing population as well as a large contingent of Salvadoran people. We are excited to bring the OC Blues and our international opponent in front of this soccer loving community,” said Jon Spencer, the OC Blues General Manager. CD Marte will be coming to Orange County with four Salvadorian National Team members on their roster: defender Mario Martinez, defender Marcelo Tejeda, forward Danis Ramirez, and defender Francisco Garcia, who just earned his first call up with the national team for their recent friendlies against Colombia and the Korea Republic. CD Marte has won eight Primera Division titles. They also won the CONCACAF Cup Winners Cup in 1991, and were the runners-up in the 1981 CONCACAF Champions League, then called the CONCACAF Champions Cup. The 45,000 seat Estadio Cuscatlan in San Salvador serves as the home pitch for “Los Maricanos” as well as the Salvadorian National team. Located in the heart of Orange County, the City of Santa Ana has a population of 330,000 and ranks as the fourth densest city in the nation. With access to four major freeways and a regional transit station, which services Amtrak and Metrolink, Santa Ana is a convenient place to live and work. Santa Ana is home to local, state and federal government offices including the District Attorney’s Office, Orange County Courts and the Ronald Reagan Federal Courthouse. The City is also home to major institutions and corporations including the Bowers Museum, Discovery Science Cube, the Santa Ana Zoo, Yoko-hama Tires, Crevier BMW (the #1 dealer in the Western United States for the past 25 years), First American Title Corporation, Behr paint, Ingram Micro and the Orange County Register. With its historic architecture, charming streets, live/work lofts, and vibrant restaurant scene, Downtown Santa Ana continues to be regarded by major news publications as one of Orange County’s best neighborhoods.